Welcome to the season. The last time we saw NFL football, Sammy Watkins was in Buffalo, Adrian Peterson was in Minnesota, and Jamaal Charles was in Kansas City. A LOT has changed since last year, including what defenses are good/bad match-ups for fantasy. So, I present to you my first starts and sits article of the season. There aren't specific rules based on talent or production, just guys I expect to have a great week, by their own standards. Basically the only condition is that you didn't play Thursday night (sorry, Chiefs and Patriots fans). Entering his third year, Marcus Mariota has the opportunity to get off to a hot start against the Oakland Raiders, a defense that gave up the most rushing touchdowns to QB's in the league last year, and gave up the 9th most passing yards in the league. Mariota has been one of the most efficient quarterbacks since entering the league, posting a 33:0 TD:INT ratio in the red zone. Now, he has an extremely underrated red zone weapon in Eric Decker and a highly-regarded talent in Corey Davis. The weather will be perfect tomorrow, which held the two teams back when they met last year. Oakland is an elite offense, and that allows the game to turn into a shootout which would equal more fantasy points for Mariota. Oakland gave up almost 25 points per game last year, and Tennessee could easily score 30+. Everything is lined up perfectly for Mariota, and he has a great opportunity to begin a breakout year on the right foot against Oakland. 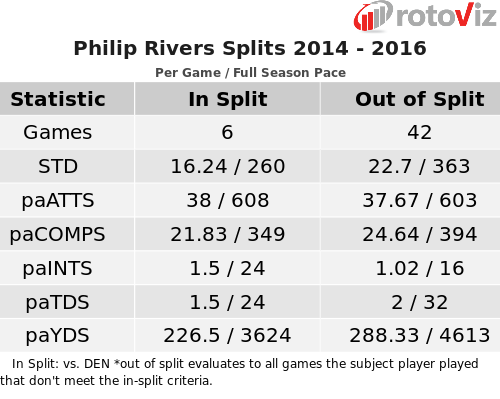 Though Phillip Rivers is one of the most consistent guys in the league, that doesn't mean you should roll with him in week one. I've seen him stacked with guys like Ben Roethlisberger and Dak Prescott on a lot of teams, and you're better off starting them over Phillip. Rivers has scored over 20 fantasy points just once in his past 5 games against Denver, Also, he's without Mike Williams for the first few weeks. Denver is an absolutely brutal defense to face-they allowed under 3000 yards passing over the entire season last year! 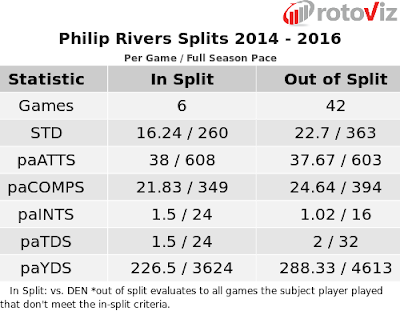 However, if you didn't draft a backup, I do not recommend dropping him for a different QB, because Rivers will give some form of production no matter what. I put two guys here because it depends on the format. In PPR, you can't leave McCaffrey on the bench. SF gave up 27.6 fantasy points per game against RB's last year, and gave up the most yards and the most touchdowns. Reports are saying that the Panthers have a large amount of plays dedicated for McCaffrey this week, and he will see an ego boost playing against a poor San Francisco defense. As for Todd Gurley, he's a great play in any format as LA figures to lean on him as they ease Sammy Watkins and Cooper Kupp into the offense. Gurley will start his bounce back campaign off strong tomorrow with an easy matchup against Indy next week. This is bold, I know. Leaving Beast Mode on the bench in his debut? Yes. There's been little news reports on Lynch this off-season. In fact, the last Rotoworld report other than stats came in July, which was a report that Lynch is expected to see under 200 carries. Tennessee is no easy task for Marshawn, as they allowed the 2nd lowest fantasy point total to RB's last year. It also figures to be a negative game script for Lynch, because if it turns into an air attack like it should, Marshawn has no business being on the field. If I have another stater on my bench, I'm putting them in over Lynch tomorrow. Better safe than sorry. I love Diggs this year, and I love him even more this week. New Orleans gave up the 7th most receptions and 6th most yards last year. Diggs has also been incredible in the beginning weeks of both his NFL seasons, scoring at least 17 points in each of the first two weeks of the last season and at least 14 in the first 4 weeks of his 2015 campaign. The game script will also be in Diggs's favor Monday, going up against Drew Brees and the Saints is sure to help Diggs get some targets. Diggs will begin his breakout year on Monday. Hilton is a terrible choice this week. It's been said by just about everyone, but it still needs to be said. 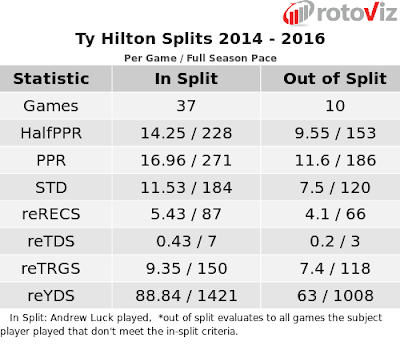 Scott Tolzien is simply not good enough to get Hilton the targets he needs to produce like Hilton would if Andrew Luck was there. Because Indianapolis is so injured, you would expect a blowout, but the Rams aren't an electric offense so the game will never really be out of reach. I'm staying away from Hilton until he gets Luck back. The biggest beneficiary of Jordan Matthews's departure was Zach Ertz. 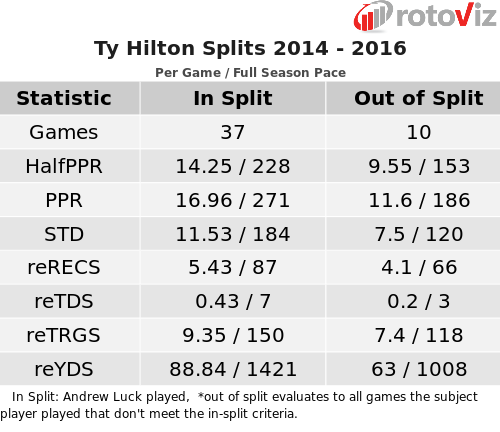 He performs excellent in the slot, and faces a Washington defense that allowed the 8th most fantasy points to tight ends last year. Carson Wentz looked sharp in preseason, and the Eagles are not good in the RB position, which leads to Ertz's success. This isn't a knock on Ebron in any way. It's just the Cardinal defense is incredible against TE's. They didn't even give up 3.5 FPPG last year. They gave up just two touchdowns. Also, Jim Bob Cooter, the offensive coordinator, said Ebron's role will "show itself as it goes," which doesn't exactly sound positive. I'm staying away from Ebron this week.